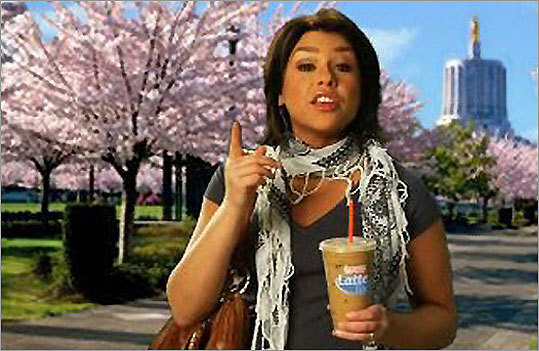 This flap is so chock full of objects of Internet scorn that it’s hard not to get a little dizzy: Right-wing nutcase Michelle Malkin has won a victory over baby-talking Food Network personality Rachael Ray, who was hawking obesity-causing products for fast-food company Dunkin’ Donuts while wearing what appeared to be a kaffiyeh, the cotton scarf that most Americans associate with Palestinian nationalists, especially the much reviled late Yasser Arafat. Malkin called out Ray and Dunkin’ Donuts on the faux kaffiyeh being visible in the online ads and got the conservative blogosphere buzzing about a potential boycott of the donut chain. And guess what: Dunkin’ Donuts caved and yanked the ads. It’s probably hard for many people to decide who deserves the lion’s share of their wrath: Malkin for ignorant (and, as always, borderline racist) demagoguery, the insipid Rachael Ray for aggressively embracing the role of foodie icon while shamelessly peddling nutritional nightmares, or Dunkin’ Donuts for manufacturing said fare in the first place and for backing down in the face of Malkin’s toothless swagger. Media cowards intimidated by the politically-correct clothing police. Good post. Now, let’s get back to normal. I’m sure you can justify any internment or mass murder with similar statements. Besides, everyone knows Tim Horton will own and run everything a la Taco Bell, not too differently then in 1993’s Demolition Man starring Silvester Stallone. #65 – This is the mess Krispy Kreme has made. Gee, I wish I had your imagination for my next book. Of all the people on this blog, you consistantly come up with some real winners. My next book will be on great Conservatives. So as I said, I wish I had your imagination so it will be more than one chapter. This whole terrorist scarf incident is a great way for the GOP to keep the news from focusing on Scott McClellan’s book where he plainly says that Bush committed treason against the United States of America by leaking deep cover agent Valerie Plame’s name to the press. Bad Behavior has blocked 14094 access attempts in the last 7 days.